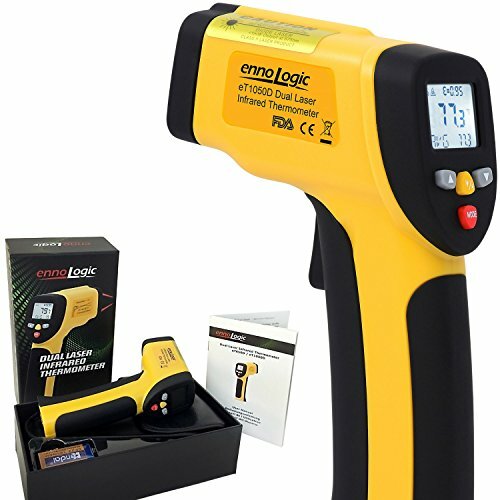 The eT1050D from ennoLogic is a noncontact infrared thermometer that allows you to measure the temperature of an object from a distance by sensing its radiated infrared energy. It is a feature-packed instrument with countless home and industrial uses that include cooking (pizza, grilling, candy and chocolate making, tea, beer and wine home brewing), food safety, refrigeration, forging and metalworking, soap making, automotive, A/C, HVAC, pool, and even animals (reptiles, chickens). NOT designed for body temperature measurement or medical use. The ennoLogic eT1050D comes with a 10-Year Warranty, a Hassle-Free Replacement Guarantee, and a Risk-Free 100% Money Back Guarantee. ACCURATELY AND QUICKLY MEASURES SURFACE TEMPERATURES UP TO 1922°F. Use it in your kitchen to instantly measure the surface temperature of food, pizza stones, oven walls, range tops, frying pans or fryer oil, grill, refrigerator and freezer. Scan for insulation leaks in your home, check air conditioning, heating vents, pipes. Inspect your cars cooling system, catalytic converter, brakes, and tires. Or check the temperature of chicken coops, terrariums, and reptile enclosures. DUAL LASER POINTER FOR PRECISE TARGETING of test area. ADJUSTABLE EMISSIVITY improves the measurement accuracy across different surface types. By setting the emissivity of your IR thermometer to match the material you are measuring, you obtain a more accurate reading. Emissivity is adjustable from 0.10 to 1.00 and a table of emissivity values is included in the manual. AUTO SHUTOFF after 7 seconds. All user settings for laser, backlight, °C/°F, and emissivity are retained between uses. SCAN FEATURE TRACKS MINIMUM, MAXIMUM, AND AVERGAGE READINGS while scanning for increased accuracy. Hold button to scan a surface area and find the average, maximum, or minimum temperature for the whole area instead of only a spot reading. This allows you to see temperature variations on a surface. The averaging feature can also be used to obtain a more reliable and accurate reading. To keep track of more than one reading, a MANUAL LOG feature allows you to store up to 20 readings in memory. HIGH AND LOW TEMPERATURE ALARMS can be set to provide audible feedback when a target temperature is exceeded. Use this handy feature to easily detect when a specific temperature is reached or exceeded, e.g. frying oil. Also includes convenient LOCK FEATURE for continuous hands-free measurements. This allows you to set up the thermometer to continuously monitor an area without pressing the trigger button. The Lock feature is particularly useful when combined with the audible High or Low alarm. VERY WIDE MEASUREMENT RANGE of -50°C to 1050°C (-58°F TO 1922°F). Resolution: 0.1°C/0.1°F. Accurate to ± (1% of reading+1°C/2°F) or ± 2°C/3.5°F, whichever is greater. FAST RESPONSE TIME AND FAST POWER-UP. ACCURATE AND EASY TO READ. Backlight and lasers can be turned on and off independently. Switch between CELSIUS AND FAHRENHEIT. Comes with user manual, 9V battery and holster. FDA, FCC, and CE compliant. 10-YEAR WARRANTY, HASSLE-FREE REPLACEMENT GUARANTEE, and 100% MONEY BACK GUARANTEE.